Knowledge management is essentially about getting the right knowledge to the right person at the right time. This in itself may not seem so complex, but it implies a strong tie to corporate strategy, understanding of where and in what forms knowledge exists, creating processes that span organizational functions, and ensuring that initiatives are accepted and supported by organizational members. Knowledge management may also include new knowledge creation, or it may solely focus on knowledge sharing, storage, and refinement. For a more comprehensive discussion and definition, see my knowledge management definition. It is important to remember that knowledge management is not about managing knowledge for knowledge's sake. The overall objective is to create value and leverage and refine the firm's knowledge assets to meet organizational goals. Strategy: Knowledge management strategy must be dependent on corporate strategy. The objective is to manage, share, and create relevant knowledge assets that will help meet tactical and strategic requirements. Organizational Culture: The organizational culture influences the way people interact, the context within which knowledge is created, the resistance they will have towards certain changes, and ultimately the way they share (or the way they do not share) knowledge. Organizational Processes: The right processes, environments, and systems that enable KM to be implemented in the organization. 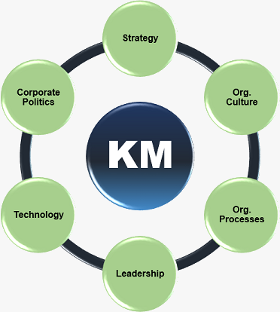 Management & Leadership: KM requires competent and experienced leadership at all levels. There are a wide variety of KM-related roles that an organization may or may not need to implement, including a CKO, knowledge managers, knowledge brokers and so on. More on this in the section on KM positions and roles. Technology: The systems, tools, and technologies that fit the organization's requirements - properly designed and implemented. Politics: The long-term support to implement and sustain initiatives that involve virtually all organizational functions, which may be costly to implement (both from the perspective of time and money), and which often do not have a directly visible return on investment. In the past, failed initiatives were often due to an excessive focus on primitive knowledge management tools and systems, at the expense of other areas. While it is still true that KM is about people and human interaction, KM systems have come a long way and have evolved from being an optional part of KM to a critical component. Today, such systems can allow for the capture of unstructured thoughts and ideas, can create virtual conferencing allowing close contact between people from different parts of the world, and so on. This issue will also be addressed throughout the site, and particularly in the knowledge management strategy section. At this point, the articles presented on this site focus on the first five dimensions. For now at least, the political dimension is beyond the scope of this site. Throughout the site, I will explain and discuss known theories, occasionally contributing with some of my own frameworks. I will also discuss the potential role of knowledge management systems from a broad perspective, and in the section on KM tools I will provide specific advice on this topic. I have tried to organize the site as logically as possible, moving from a general introduction to knowledge and KM to introducing key subjects like organizational memory, learning, and culture. The later sections discuss several models and frameworks as well as knowledge management initiatives, strategy, and systems, before finally presenting an overview of various tools and techniques.